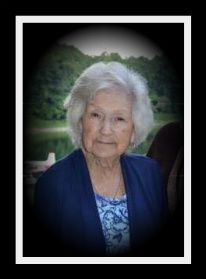 Polly Fluty, age 99, formerly of Louisa, KY, went home peacefully to be with her Lord and Savior on August 8, 2018. She is preceded in death by her loving husband Theodore "Ted" Fluty, two daughters; Ethel "Snookie" Baumgardner and Jamima Evelyn Mathias, and two grandchildren; Carla Alamedia and Kevin Edkins. She is survived by one daughter, Loretta Edkins of Cranberry Twp., PA, and one son, Robert Douglas (Mary) Fluty of Lake Suzy, FL. She is also survived by 8 grandchildren; Debra (John Bryan) Endicott, Randy (Gina) Endicott, Michelle (Gary) Sanders, Greg Archie, Jerry (Teresa) Archie, Karen (Dan) Marks, Keith (Cindy) Edkins, Chris (Robin) Fluty, 19 great grandchildren, 26 great great grandchildren and one great great great grandchild. Funeral Services will be held Monday, August 13, 2018 at 1:00 PM at New Friendship Church with John Goble and Maurice Mills officiating. Burial will follow at the Fluty Lick Cemetery. Friends may visit at the funeral home on Sunday from 5:00 to 9:00 PM. Arrangements are under the direction of Crum Funeral Home of Inez.